Are you trying a low carb or ketogenic diet to lose weight or improve your health? These low carb pancakes are super easy to make and adhere to a keto diet. Over the years, I have discovered that I am best able to maintain my weight when I stick to a low carb diet. Many women are discovering the same thing applies to them and they’re having success with a ketogenic diet. I have found that breakfast is a meal so many moms struggle with when trying to stick to a ketogenic diet. Fortunately you can have traditional breakfast foods like pancakes on the ketogenic diet – if you know how to make them. If you’ve had banana pancakes, low carb pancakes use a similar sort of method. Eggs are used as the binder, but cream cheese is used instead of bananas (too many carbs in bananas!). I find that you do need to add a bit of stevia to get a sweet taste. Many people also add cinnamon and vanilla extract. This recipe will make enough pancakes for 3 people to have 2 pancakes each. You can also make them, then refrigerate them and heat them up in the morning for breakfast by quickly warming them on a pan. I haven’t tried freezing them yet. 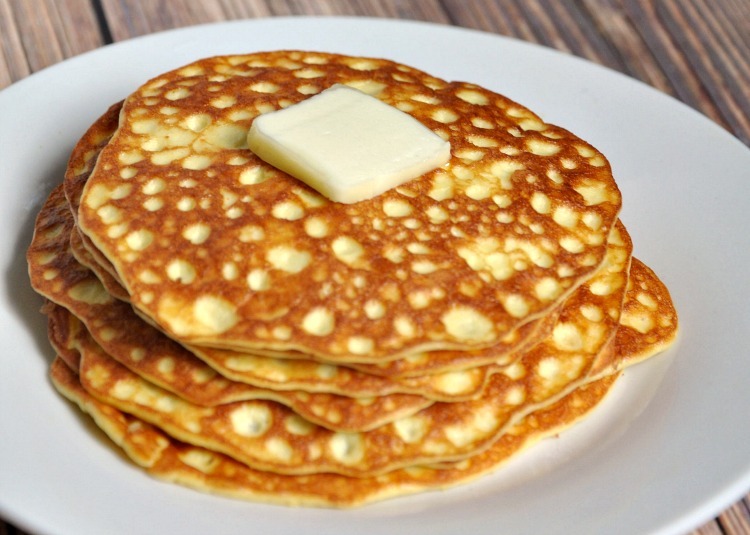 If you’re venturing into a low carb or ketogenic diet, give this simple low carb pancakes recipe a try and let me know what you think in the comments below. If you don’t feel up to making your own keto pancakes, you can also buy keto pancake mix on Amazon! You can also buy ketogenic pancake mix if you want to have something quick on hand. Put all of your ingredients except for the butter/butter into a blender, then blend until the mixture is smooth. Pour the batter directly from the blender's pitcher into your frying pan (that has been both pre-heated and greased with butter). Once bubbles appear evenly across your low carb pancake, flip and cook until the other side is cooked. Remove the pancake from the pan and transfer to a plate, then top your low carb pancakes with butter or ghee. You can also buy ketogenic pancake mix here. Did you know you could have low carb pancakes on the ketogenic diet? Would you please send me the nutritional information for the cream cheese pancakes? I really like them but have no idea how many carbs, fat, etc are in them. I am new to the Keto diet so I am really trying to stay within my goals. Diana, there are websites where you can typically look up nutritional information for each ingredient and add them up. Give it a try! How can I find that at? How many pancakes can this recipe yield? Quite a few. I would say at least 9 to 10 small pancake. They are thin. They hold up well if you want to cook them all to microwave on the next day. Like your article and I do appreciate the effort that goes into creating and maintaining a blog. However, people on a Keto diet rely on knowing the Macronutrients. It would not be that much harder to include this information in your blog rather than asking us to go look it up. A suggestion to get more folks coming back to your site. Thanks for the feedback Carlos! I do think I broke it down in the comments for someone but I’ll add it to the post itself soon. Is the butter in the recipe call for one full stick? How much butter you use is up to your tastes. It’s just for greasing the pans and adding to your pancakes after they’re cooked for flavor. I am a pancake freak always have been and can tell you these are fantastic and soooo easy love them will def make many more. I’m so glad you enjoyed them Angela! 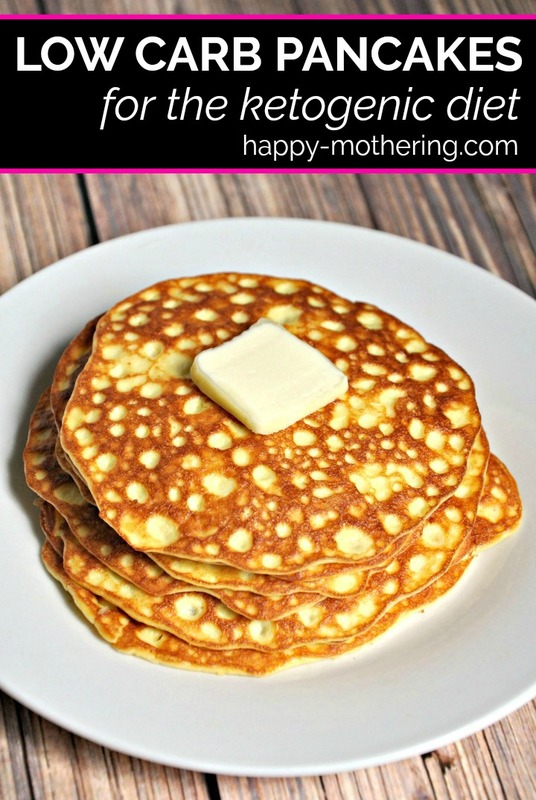 These pancakes are wonderful and so easy to make! Thank you for posting the recipe. I’m glad you like the keto pancakes! Dear Happy Mothering, sweet, sweet lady, I greatly admire your patience and your recipes. What you please post the Macronutrients please? Should the cream cheese be melted before adding the eggs, etc? I couldn’t get it to smooth out when I was using my blender because the cream cheese wasn’t melted. I typically use room temperature cream cheese. I followed the recipe exactly but couldn’t get the batter to thicken, it was pure liquid and would spread across my skillet. Any tips? They are a bit thinner than traditional pancakes. Is the consistency more like crepes? They will be a bit thinner like crepes. I also typically use Green Valley Organics Lactose Free Cream Cheese so I’m not sure if that has a different consistency than what you’re using. These pancakes look delicious! I’ve saved to my Keto board on Pinterest. My daughter and everyone I know are on the Keto diet! Thanks for sharing! It does call for coconut flour already. Use a good blender and that tends to air fluff the batter somewhat which thickens the batch. Looks so good! Thanks for sharing at the What’s for Dinner party. Delicious! It’s thin than the usual pancake which I think makes it extra fun – possibilities are endless! I am going to have to google what ketogenics is….I keep seeing it everywhere. Thanks for linking up with the Blended Blog. I recently lost 30 pounds in 90 days. Really easy. I spent over $1000 and didn’t have this much success! Your Pancakes look awesome! Thanks so much for sharing your post with us at Full Plate Thursday. Have a great week and come back soon! They look yummy! Thanks for sharing with SYC. Beautiful, light, and fluffy batter! The pancakes turned out great! If people were struggling with the batter being too runny, they might try turning their heat up a little and pouring the batter more slowly. My pancakes look like yours! Thanks for the recipe. Keep ’em coming! PS- they taste awesome…just like “real” pancakes. I have not tried the recipe yet but I can’t seem to figure out where the listed avocado oil comes into play. it seems as though the butter is used to grease the frying pan and for topping but it specifically says don’t put avocado oil in and I don’t see it mention anywhere else. It looks like that was only listed on the printable part of the recipe, not the other section. Not sure why it was there, but it’s been fixed now. Thanks for bringing it to my attention. She took the time to give you a recipe and carb count. If you want micronutrient counts then you do it yourself. She isn’t your doctor, nurse, nutritionist, personal assistant nor your babysitter. Are you that spoiled you can’t do something for yourself? If you skip the coconut flour and replace with carb free vanilla protein powder it ups the macros dramatically and reduces the carbs by half, I believe. And I don’t have to use the stevia that way either. Hi there! My cousin just introduced me to the Yummly app an hour ago because my oncologist, who recently diagnosed me with Stage 0 Leukemia with anemia, told me to use the Ketogenic Diet now. I’m blown away with all the (what looks like) awesome recipes I’m finding for this diet! I’m a sugar-aholic and found it so easy to immediately switch over to Stevia or cane sugar after eating sugar all my life (I’m 58 years young). 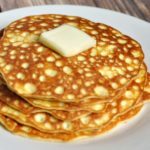 I love, love, love crepes so much more than pancakes and can’t wait to try this Low-carb Pancake recipe you posted. From the bottom of my heart, I thank you so very much for sharing it with everyone. If you have any suggestions for people dealing with cancer please recommend as I need all the help I can get at this point. Not only am I devastated by the diagnosis but I’m also unable to think real clearly right now. Again, thank you. Extra carbs in vanilla extract and cinnamon??? I’m confused about that. Uh… I halved the batch because it was just me, which was sufficien,t but I don’t know how you would get 3 people full from this recipe haha! It was good but they just fell apart. What is the nutritional information on this recipe? Very good, but where is the nutritional label? Enjoyed these. Not eggy and hubby & I both liked them. Will make again. Okay, just getting started with keto, but why lactose free cream cheese? Does it matter just for the recipe? Or the whole diet? 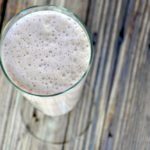 Lactose is a sugar, so I prefer to avoid it in keto recipes. Hard cheeses have much less lactose than soft cheeses so I like to look for lactose free cream cheese. Not everyone does though. First time using my coconut flour for keto pancakes. Love this recipe. Will definitely be using it for my go to pancake recipe. ? These pancakes were amazing!! It is so hard to find food that tastes like “the real thing” and these are by far the best I have found! Thank you so much!! Thank you! I’m so happy to hear that you loved them! Yes we like these! I was pleased to have the nutrition label. This info says 244 cals and gives macros per serving but I cant find out how many servings are estimated for the quantities given. I am aware from comments that people are making up to 12 thin pancakes but I’d love to know what the info refers to. Or maybe what the whole recipe yields so then i can divide it up to get my carb count per pancake. Many thanks!!! Best keto pancakes I’ve made. We layered them with sliced ham and shredded cheese for a lovely lunch/brunch. Thank you! Should have mentioned – I skipped the sweetener and vanilla as they don’t need it.